The University of Illinois at Chicago’s online bachelor’s degree program rankings continue to rise. 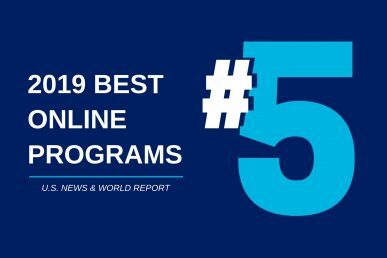 According to the latest rankings in U.S. News & World Report, UIC’s online programs — in health information management, business administration and nursing — are fifth in the nation, up from 15th last year. UIC tied with Pennsylvania State University – World Campus and University of Florida. U.S. News & World Report ranked more than 300 programs based on criteria including student engagement, student services and technologies, faculty credentials and training, and peer reputation. The Bachelor of Science in Health Information Management Degree Completion Program prepares students with an in-depth understanding of cutting-edge practices and methodologies, while applying real-world experiences to make a seamless transition from degree to profession. UIC’s Bachelor of Business Administration Degree Completion Program provides students with a well-rounded business education, while establishing a foundation for lifelong learning. The UIC RN to BSN Online Degree Completion Program is designed for students who are already practicing registered nurses seeking to continue their education. The online nature of the program and strong engagement from faculty and advisors creates an environment in which students can successfully manage their studies, career and personal life. Since students are nurses already working in the profession, there is a great opportunity for them to bring work experience to the classroom and take back knowledge to the work site. These working students get access to a high-quality BSN completion program and are able to sustain their enrollment because of their personal commitment and the support of faculty and staff, said Catherine Tredway, program director and clinical instructor. “Advisers put in countless hours with each student, and instructors are present in the ‘classroom’ with frequent announcements, quick responses to questions, participation in discussions, and continual interaction with students,” Tredway said. UIC’s Online Master of Engineering Program was ranked 40th in the nation in the 2019 rankings. According to the U.S. News website, the vast majority of students enrolled in these ranked programs have earned at least some college credit. Rather than first-time college students, they are more likely to be working professionals in their 20s to 40s looking to advance in or change their careers.